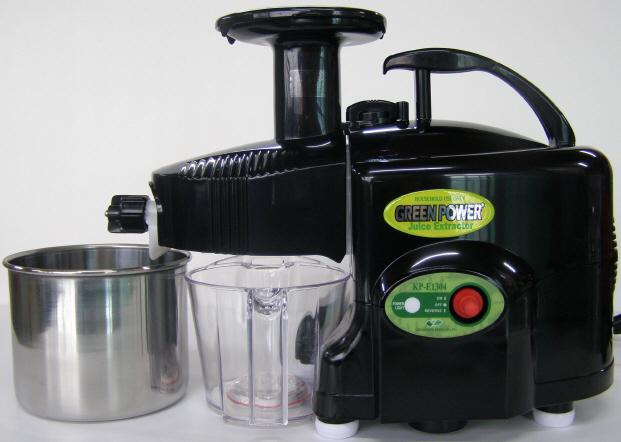 The Green Power KPE-1304 Juice Extractor is easy to clean and to carry. The Green Power KPE-1304 Juice Extractor filters out harmful pesticides extracting the natural juice in fruits and vegetables. The twin metal gears do not touch each other which prevents any possibility of metal scraps caused by friction to get into the juice or pulp. Two adjustable pulp inlet caps permit high levels of juice extraction from a wide variety of fruits and vegetables. Vegetables and various grains can be easily ground. Using multi-purpose parts (optional), it can make a variety of pastas and noodles, as well as juice. The low speed rotation (160 rpm) of the unique, powerful, twin gear impeller and pressing system generates virtually no heat that would cause denature to the juice. Fruits and vegetables are thoroughly crushed, rather than cutting and shredding them into small pieces. The automatic motor thermostat prevents the motor from overheating. Gear Length, Cutting Length 2-7/8"
Juicing Vegetables Carrot, Celery, Wheatgrass, Parsley, Spinach, Kale, Ginger, Sprouts, Cucumber, etc. Juicing Fruits Orange, Grape, Apple, etc. Crush Screen Fruit Sorbet, Mincing meat and fish, Strawberry or Berry Jam, etc.